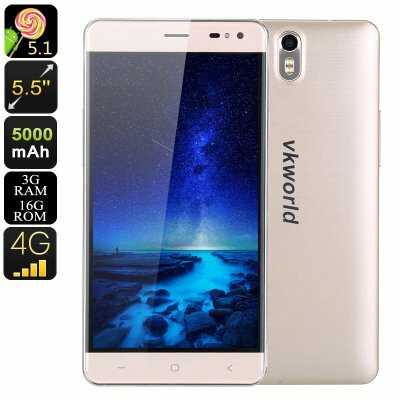 Successfully Added HK Warehouse Android Phone VK World G1- 5.5 Inch Display, Octa-Core CPU, 3GB RAM, 5000mAh, 13MP Camera, Dual-IMEI (Gold) to your Shopping Cart. The VK World G1 is the perfect budget Android phone for anybody out there who is looking for a cheap smartphone that brings along a fast and powerful performance. Packing sophisticated hardware, this affordable Android smartphone allows you to play games, watch movies, and browse the web on the go. It holds a beautiful 5.5 Inch HD display that supports the latest IPS technology thanks to which it portraits all your media in breathtaking color and stunning detail. Along with its epic 5000mAh battery, it brings along a mesmerizing amount of power that will get you through numerous days’ worth of regular smartphone usage – allowing you to head out with confidence without needing to worry about battery life. Supporting two SIM card slots and Dual-IMEI numbers, this Android mobile phone allows you to be connected to two network providers at all times. Perfect for separating work and private life or for when traveling abroad – this Dual-SIM smartphone brings along great connectivity no matter where you’re at. The Android phone furthermore supports 4G connectivity, letting you enjoy the fastest mobile data speeds out there. Whether you’re at home, in the office, or traveling abroad – with the VK World G1 smartphone you’ll always be able to stay connected to your friends and loved ones. Packing the MediaTek 6753 Octa-Core processor that reaches clock speeds up to 1.3GHz along with 3GB of RAM, this cell phone lets you engage in online games, use Android applications, and watch HD movies without dropping a frame. With access to the Play Store, you’ll be able to download millions of free Applications and other sorts of mobile entertainment – guaranteeing that you’ll never have to feel bored again. 16GB of internal storage and an additional 64GB external storage option makes sure that you’ll never run out of memory to save all your files and media alike. Coming with a high-end 13MP rear snapper, the VK World G1 Android smartphone lets you carry along a professional-grade camera at all times. Shooting breathtaking images and video alike, you can be assured that with this camera phone at your side, not a single special moment in life will ever again pass by uncaptured. Additionally, it also comes with a powerful 8MP front camera which is perfect for snapping selfies or for engaging in online video calls. The VK World G1 Android Phone comes with a 12 months warranty, brought to you by the leader in electronic devices as well as wholesale electronic gadgets..